Join us for this introduction to Night Riding, and experience the thrill of riding through the dark of night! Ideally, you’ll have off road mountain biking experience, your own bike, and a set of decent lights, but we can hire bikes and lights! This 1 day activity is perfect for riders who have daytime MTB experience, wanting to make the transition to riding in the dark. 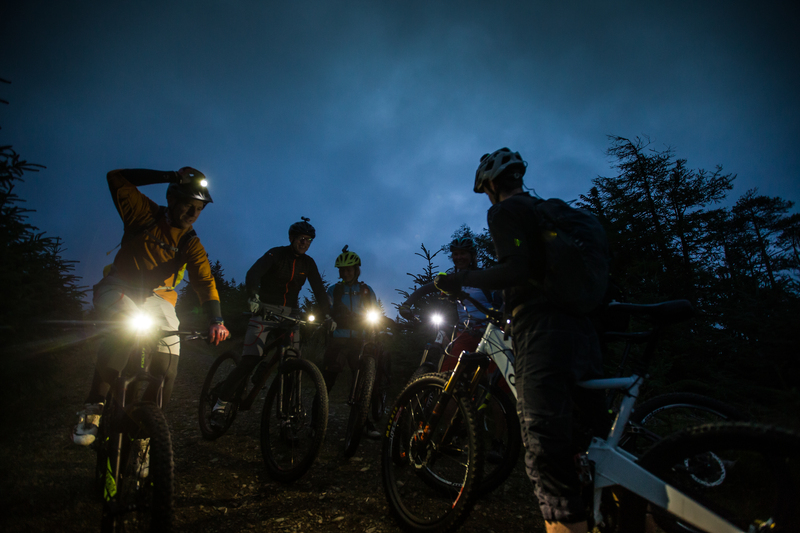 We will show you all the fundamentals of night riding, giving you the confidence to get out on your own adventures! – Having an awesome time on the trails! We’ll finish with a pint in a pub, and a bite to eat for those who wish! Your instructor is a British Cycling Mountain Bike Leadership Tutor, training and assessing riders to become MTB guides, as well as running Exmoor Adventures, an activity company in the South West, with over 20 years Mountain Biking experience. Working on a maximum 1:8 ratio. Purbeck Hills – Saturday 5th January – Please click here for details. Do you want us to run a bespoke ride/course for you and your friends? Please get in touch and see what we can do!